Window screens though simple, play an important role in our daily lives. The purpose of the original screen invented in 1836 was to keep pests that often carried parasitic diseases out of homes and businesses. With the implementation of screens by 1950, many of the diseases that plagued U.S. citizens years prior were eradicated. At Metro Screenworks, we understand the importance of screens and know that one screen doesn’t fit all. For these reasons, we offer high-quality, affordable custom screen solutions to homeowners, contractors, and whoever else is in need of custom screens. Of all the screen manufacturers and various home improvement stores, why choose Metro Screenworks? We are the Top Rated National® Screen Store and have been since 1979. Though based in Englewood, Colorado, we have helped customers around the world have high-quality custom window screens that fit their lifestyle. We offer pet- and tear-resistant screening materials that can withstand the wear and tear that our furry friends put on our screens. If you never open your door because of your allergies, we offer screens that catch pollen and other allergens, so you can enjoy a little fresh air. Have a great view, but feel that your window screens ruin it? Install our invisible screen! We at Metro Screenworks believe that window screens can do more than just simply keep the bugs out. Here are some other reasons to choose us. Read customer reviews here. As we’ve mentioned above, Metro Screenworks makes it easy to replace damaged window screens or upgrade with custom replacement window screen frames and materials. We offer made-to-order screen frames or, if you prefer, we can give you all the materials to install the your window screens yourself. We feel that screens can do so much more for you than just keep the pests out and so offer high-quality custom window screen options. Our customers also choose us because they know that when they buy from us, they are getting quality window screen materials that will do exactly what they claim to do. All of our products are made in the U.S.A. and constructed of high-quality materials. If you are, for example, looking for super screen that will withstand the elements or solar screen that will protect the interior of your home from sun damage, Metro Screenworks offers window screens that can and will do all that they claim. Ordering online is becoming the most convenient and common way to buy homegoods and home-building and repair materials. Why spend time wandering around a warehouse trying to find what you need when you can sit in the comfort of your home or office and have all the information for the products right at your fingertips? For this reason, we offer an online store that provides same day shipping on most products to anywhere in the country; if you don’t see what you need or have a question, feel free to call us! Our salesmen and customer service personnel are knowledgeable about our products. Want to visit our warehouse in the Denver-area in Colorado? Come on in! Just because we offer custom products doesn’t mean that we don’t provide a quantity discount on our window screens. If you are a contractor or a homeowner with an ambitious project and need to order custom window screens or window screen materials in bulk, contact us to learn more about our quantity discounts. Or want a sample? We can do that too! Whether you are a homeowner who needs to accomplish a simple repair or are a contractor who needs a bulk order of custom screens to finish a job, Metro Screenworks can supply you with what you need. We understand that anyone may need custom window screens and so offer the opportunity for small and large orders alike. Metro Screenworks offers a wide array of window screen products to homeowners, contractors, and others. We offer pre-made and made-to-order products as well as window screen rolls, replacement window screen frames, and the parts to build your own screens. Though we do offer traditional fiberglass and aluminum window screens, we also offer a variety of specialty window screen materials that can offer more to you than traditional window screens. Continue reading below to learn more about our specialty screen products. Super screen is a durable window screen material that you can count on. Made from the toughest materials—vinyl-coated polyester—super screen is both pet and hail resistant and can be installed anywhere: in your window screen frames, screen doors, porch screens, and more. Metro Screenworks’ super screen always comes with a 10 year warranty and can be purchased pre-installed in window screen frames or in various roll sizes. Pet screen is a similar product to super screen. However, it is made from slightly thicker strands that offer even more durability than super screen. Pet screen is also manufactured from vinyl-coated polyester and can be installed in window screens, screen doors, and porch screen panels. If you are tired of repairing your screens from your dog pawing to get out or your cat testing its claws, install pet screen! It’s seven times stronger than traditional fiberglass screening! Because these two products are similar, we often get questions about when to choose one window screening material over the other. If you need durability and visibility, super screen is what you need. If you need ultimate durability, pet screen is your best choice. Also, keep in mind that super screen is manufactured up to 120 inches in width and pet screen is made up to 96 inches in width. Are you lucky enough to have a unforgettable view right outside your home or business, but feel that the window screens take away from its magnificence? With BetterVue you no longer have to choose between enjoying a million dollar view and keeping those pesky little bugs out. BetterVue window screens allow you to enjoy more natural light, better airflow, and also reduces glare. This window screening material is made from lightweight fiberglass that can not only allow you to have better visibility, but possible up the curb appeal of your home. UltraVue is like BetterVue in that it is an invisible screen material that allows you to enjoy better outer visibility, more natural light, better airflow, and give your home more curb appeal. Both BetterVue and UltraVue can be installed in windows, screen doors, screened-in porches and more. Available in custom window screen frames and bulk window screen rolls, invisible screen allows you to have both visibility and protection from those pesky bugs as well. Both invisible screens provide similar benefits. However, there is a time for one over the other. BetterVue gives improved visibility and can cover openings up to 108 inches wide which makes it the best choice for covering large spaces. UltraVue, on the other hand, is rated to give excellent visibility and is best for window screens and smaller openings; it is available up to 72 inches wide. Our Brite Bronze screen is made of 90 percent copper and 10 percent zinc, making it a great option for a variety of uses including window screens, screen doors, and more. Copper mesh screen is incredibly durable and will weather to a beautiful bronze color. Many of our customers choose to install it in their coastal homes. However, it is a beautiful option to accent wood porches or to use in renovations of older homes anywhere. Solar screen is an excellent choice for protecting the interior of your home from the damaging effects of the sun, while still having great visibility. UV rays can cause fading, discoloration, cracking, and other damage to occur on wood flooring, upholstered furniture, art pieces, and other decor in your home. Metro Screenworks offers solar screen in a variety of strengths that can block 65 percent of UV rays, all the way up to 90 percent. Solar screen can not only help keep your home cool, thus giving your home better energy-efficiency, but this window screen material gives you the best daytime privacy, while still allowing some visibility. Though many are striving to make changes to their lifestyle, there are still quite a few pollutants in the air, and we cannot forget about organic irritants such as pollens, molds, and other organic materials that naturally occur in the air. If you feel like you can’t open your windows and enjoy fresh air unless you suffer the uncomfortable consequences of extreme allergies, air filtration window screens may be for you. RESPILON® offers window screens, sliding screen doors, and porch panels with nanofiber membrane technology that can protect you and your family from harmful pollutants in the air. 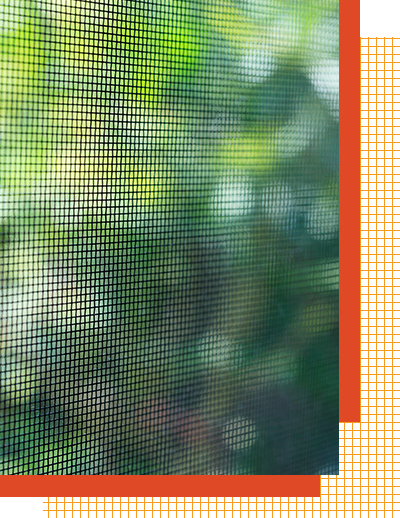 Some of the most annoying pests are those that are almost invisible: gnats and other similar insects are often referred to as no-see-ums and can often still make their way through the mesh of traditional screen. For this reason, we offer tiny mesh window screen. Tiny mesh still provides excellent ventilation and visibility, while also keeping all those nasty little insect pests out. Tiny mesh is made out of fiberglass and works for window screens, screen doors, porch panels, and other custom screen systems. SeeVue stainless steel screen offers more strength and visibility than traditional aluminum screen. Stainless steel window screen can be used in window screen frames, screen doors, screened-in porch panels and works incredibly well with pressure-treated lumber. SeeVue stainless steel screen still allows you all the benefits of traditional screen—protection from insects—but with the strength needed to withstand the wear and tear of the weather and day-to-day. For most of Metro Screenworks products, such as complete window screens, window screen frames, and other made-to-order products, you must provide your own measurements. Getting the measurements for your replacement window screen frames just right is an absolute must for us to get your order right. Below are the ways to measure for your custom window screens. If you’re unsure or have questions, contact us! If your screen has tension screen clips—which most common window screen do—see below. Follow the steps above (link to You Have the Old Window Screen). 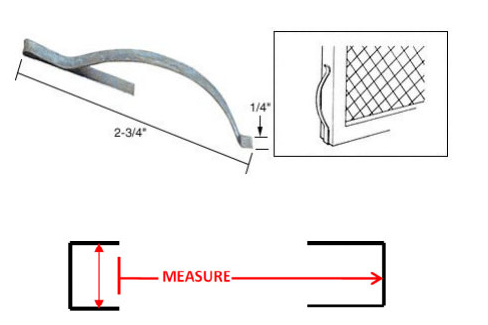 You must also be sure to measure the inside of the U window frame channel to determine the thickness of the frame. Measure the height needed to cover the opening of your window without any gaps. Deduct an ⅛ of an inch for ease of installation. In the case that you don’t have the original window screen to measure for ordering your replacement window screen frames or custom screens, that okay! Measure inside the window frame, where the screen would sit, accounting for groove in which the screen frame is placed. Also, be sure to take into account the type of hardware you would need. Not sure? Call us! We’d be happy to help. Have questions? Read our FAQ page to learn more about us, our products, and more. If you still need to know more or your question isn’t answered, feel free to contact us! Metro Screenworks offers a wide variety of screen products including screen doors, screened-in porch materials, adjustable screens, pet screen accessories, roll up shades, and more. Shop our online store for all your screening needs today! If you want to learn more about window screens, how to install them, finding the right window covering and more, read our blog. We frequently cover topics that we hope will inform, entertain, and allow you to install and enjoy your screens all year. See our recent blog posts.